Community Core Banking System | Automated Systems, Inc. The Insite Banking System™ platform is a Windows® based community core banking system that Automated Systems developed to address the unique software needs that community banks have in remaining both competitive and compliant in today’s challenging financial services marketplace. Utilizing an intuitive and user-centric design, the Insite Core technology solution provides access to a wide array of integrated and ancillary application solutions through an easy to use interface. Our modular design allows us to quickly update individual products in response to rapidly shifting technological, regulatory, and consumer environments. Insite maximizes the display real estate across any resolution or aspect ratios, allowing individuals to efficiently access data. Users can zoom or stretch-to-fit panels with a touch of the screen or click of the mouse, allowing for immediate access to additional information. Using a tile-based menu system, the user is able to launch external applications and pass parameters from one to another quickly. Our banking system solution delivers the most cost-effective, user-friendly application available, allowing community banks to provide improved customer service through merging common-sense applications with thoughtful technical innovation. All of these Windows® based module solutions are included in the Insite Banking System core software platform. Technology integrated seamlessly, provides ease of operation, quick access to critical information, management flexibility, reliability, and cost effectiveness application options for community banks. Click on the appropriate button below to learn more about how each featured module within Insite Core can assist you with your core banking system needs. The Insite Banking System Central Information File (CIF) module provides the foundation for all of the application processing modules. This module maintains a central file on all accounts within the system. This allows easy access to information concerning each customer’s total relationships with the bank – through the CIF inquiry feature, which summarizes all accounts linked to each individual customer. Ability to tie an unlimited number of accounts to an individual customer CIF profile. Detailed inquiries can be selected for any account listed on the CIF profile window. Simplified CIF lookup methods – just enter at least the first letter of the customer’s name or the actual CIF number. Provides current information on DDA accounts, Savings accounts, Time Deposits and Loan accounts. The certificate of deposit module provides you with a flexible method of accounting for all the various types of time deposits, retirement funds, and variable rate accounts. Handles multiple CD types, including IRA’s (Roth, Educational, Medical Savings, Roth Conversion). Performs simple, periodic or daily compounding. Pays monthly, quarterly, semiannually or at maturity interest payments. Tracks CD terms in days or months. Allows interest payments by check, compounding or deposit-to-another-account methods. Offers CD calculator with penalty computation. 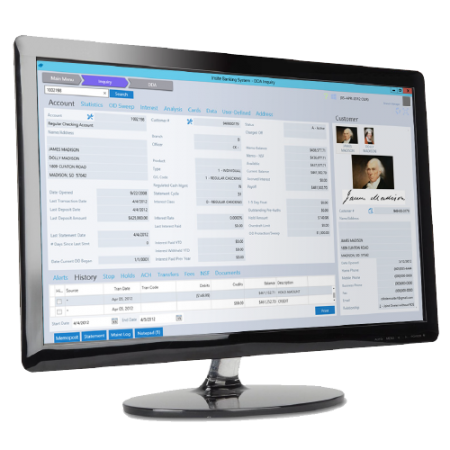 Ability to cash certificates (real-time) on-screen which automatically calculates penalty and accrued interest. Provides compound, maturity or deposit-to-another-account notices. Performs automatic rate change by types. Produce electronic filing data to IRS for tax reporting. Prints interest checks and notices. Demand Deposit Accounting Handles regular DDA, NOW, Super NOW, Money Fund accounts, Ready Reserve, and Overdraft protection. There are a variety of features you can implement for your customers with cash reserve accounts or Ready Reserve and fund sweeps that automatically transfer funds, eliminating tedious manual work. Provides current balances, available, or memo (real-time for each individual account. Performs stop payments and deposit holds. Automatically cycles statements and ability to print interim snapshot statements. Offers uni-statement option by customer: i.e., ability to show savings, CD’s and loans on DDA statement. Flexibility of service charges by cycle and customer type based on the selected specifications. Support for check-image capture products and image statements. Gives profitability information by account (as a by-product of end of cycle processing). Allows automatic transfers to and from savings. Allows automatic loans to cover overdrafts. Performs float control and analysis. Allows unlimited exception reporting through the Report Writer. Provides choice of statement formats. Integrated Document imaging for signature cards, financial statements and the like. The Direct Exception Processing (DEP) module provides the end-user with the ability to manage the stop pays and NSF items presented for payment with little effort. This module creates an item specific notice based on the one-digit transaction code you enter in a fast-entry edit screen or an account details screen (based on user preference). The DEP module features an option to separate transaction items by branch if so desired. There are also options for including stop payment items in the DEP module or to process them in a separate utility. Other user-preferences include: Displaying all items presented for payment on the NSF account; Displaying only NSF items exceeding OD Limit placed on account; or Displaying all NSF items, including both within and in excess of OD limit. Processing these NSF and/or Stop Payment transactions is efficient with single-entry transaction codes to determine the action taken on the transaction item. Each item is listed with a transaction description if applicable (ACH, Descriptive, Suspect Stop Pay, Returned Stop Pay). You can process these transactions in the Fast Entry screen, which is a snapshot of the transactions or in the detailed Action Code Entry option that displays account information such as OD Limits, OD history, Memo Balance, Available Balance, and other pertinent customer information. You also have the ability to override the service charge default to augment calculated service charges. The General Ledger Accounting module combines all of the sound financial principles you are accustomed to with the efficiency and speed of computer technology to quickly and accurately perform General Ledger transactions. Provides multiple department or branch financial reporting and consolidated reporting. Interfaces with all modules in the Insite Banking System. Reports budget by month, with comparison reporting to current or prior year actual. Reports comparison variance by percentage or by dollar on demand. Prints daily statements, Profit and Loss statements. Creates daily statements, Profit and Loss and Balance Sheet Reports. Ability to track history and transactions for Individual Retirement Accounts, Roth, Roth Conversions, Medical Savings Accounts, Educational IRA’s, Keoughs, SEPs, and more! Allows multiple retirement accounts for one individual. Automatic interfacing with the Certificate of Deposit Module which alleviates having to reenter transactions. Complies with Federal Guidelines in providing electronic filing medium at the End of Year and on April 15th. Creates customer contribution and distribution statements along with a 5498 statement for April 15th processing. Account balance verification makes it easy to track incorrect postings and various distribution/ contribution types. An easy-to-use system that provides prompts right on the screen, Report Writer offers 132 column formatting and flexible field selection to put you in control when it comes to creating the reports you want. Saves report definitions for future use. Prints reports or displays them on screen. Allows multiple-heading lines on each report. Permits display of headings and print masks on the screen while creating or modifying report. Allows up to four sort keys on each report, ascending or descending with ranges and subtotals. Performs calculations on selected fields: adds, subtracts, multiplies, divides. Capability of prompting user with report query inquiry so the report doesn’t have to be edited each time it is printed. The Insite Banking System application provides you the ability to access your databases through almost any SQL-compatible spreadsheet or database program. The user is able to bring current data directly into their spreadsheets whenever they want! The Windows-standard interface mechanism gives users what they want – the keys to their own information vehicle. The ODBC Driver comes with a utility that reads the information from your data files and builds runtime SQL access structures. Insite Banking System is compatible with all ODBC standards. Allows use of Total Bank information in Marketing for your bank. Allows queries into any field within the Bank System. Allows the Creation of special Executive Reports, including charts and graphs. Insite Banking files with proper security. Eliminates tedious reentering of transactions – all transactions are automatically posted to their respective modules. Maintains history of box transactions. Ability to automatically debit a customer’s account when the Billing Date is due. Automatically bills, assesses late charges and creates late notices for the customer. Ability to associate different safe deposit box sizes with various fees and discounts. The supplementary, add-on, Windows® based application solutions are designed to eliminate tedious data entry or interfaces to other programs. The add-on products are designed to interface directly with the Insite Banking System with the easy click of a button. The Insite Banking System solutions aid your financial institution’s technology in daily processing and eliminates 3rd party vendors and fees. The GLA module was designed to assist bank staff with loan servicing responsibilities associated with government programs offered by entities such as the Federal National Mortgage Association (FNMA) and the Federal Home Loan Bank (FHLB). Click here to learn more about our GLA Module.